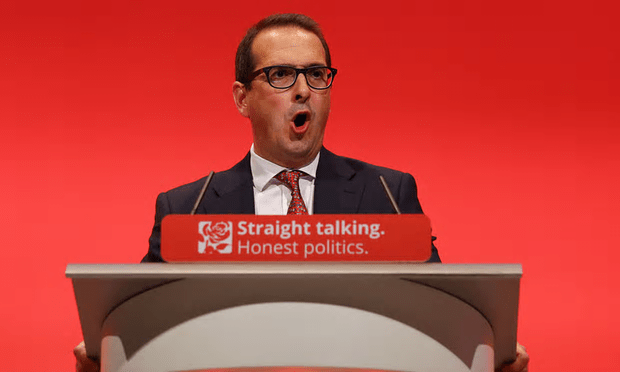 Splitting the splitters: Owen Smith has triggered in-fighting between factions among Jeremy Corbyn’s opponents – all of whom have, of course, betrayed the slogan on the podium shown here [Image: Gareth Fuller/PA]. After a tentative announcement that Angela Eagle would run in the Labour leadership poll as a ‘unity’ candidate was met with widespread derision on the social media, MPs who oppose Jeremy Corbyn are now divided over who their candidate should be. They don’t want to field two candidates because this will split their already-small proportion of the vote, and they are desperate to find someone who can lure Labour members away from supporting Mr Corbyn. The rebellion in the Parliamentary Labour Party has been labelled the #ChickenCoup on social media because, while its members are trying to mount a coup against Mr Corbyn, they are afraid of revealing their treachery to members of their own constituency parties, who support the Labour leader. So you get comments like those in The Guardian today, in which supporters of Angela Eagle are now making accusations against late challenger Owen Smith. Particularly interesting is the point that, if she is questionable because she voted for the Iraq War, then he must also fall under suspicion, because he was a special advisor to an MP who voted for that war. And the National Executive Committee is meeting to decide whether Mr Corbyn needs nominations from 51 MPs before he can appear on the ballot paper. This should be a rubber-stamp exercise. With the support of 95 per cent of constituency parties, it seems clear that Corbyn must be allowed to stan,d automatically. The outrage if he is barred may sink Labour more surely than any of the shenanigans we have seen so far. Labour’s leadership challenge against Jeremy Corbyn was up in the air on Thursday morning after plans for Angela Eagle to trigger the contest came up against an alternative pitch from the former shadow work and pensions secretary Owen Smith, who has collected nominations from dozens of MPs. Sources say that Eagle, who also resigned from her shadow cabinet position, is meeting Smith so that the party can agree on a single candidate, with MPs on both sides pushing hard for their preferred choice. Allies of Eagle insisted that she remained the unity candidate who had support across the party, and accused Smith of “scrabbling” for nominations at the last moment. But some MPs have told the Guardian they believe Smith has the better prospect of beating Corbyn because he is further to the left politically. They also fear Eagle could be attacked by the leader’s supporters because the Chilcot inquiry will be published next week, and she voted in favour of the invasion of Iraq in 2003. Eagle’s supporters dismissed the suggestion, pointing out that Iraq was an issue for lots of politicians, including Smith, who was an adviser to the MP Paul Murphy, who also voted for the war. Meanwhile, the party’s national executive committee will meet to vote on whether Corbyn ought to be automatically placed on the ballot or if he will have to collect the nominations of MPs. One piece of legal advice, leaked to the Guardian, suggests that he does not need support, but can simply run again. But NEC sources have suggested that there is a second document, which has not been seen, showing the opposite, with many pointing to a 1980s contest in which Tony Benn challenged the leader, Neil Kinnock. They point out that Kinnock was expected to collect nominations. Please consider coming back to Labour at a later date, if that happens.